The natural eco-friendly interior is made with natural raw materials and mortar walls. 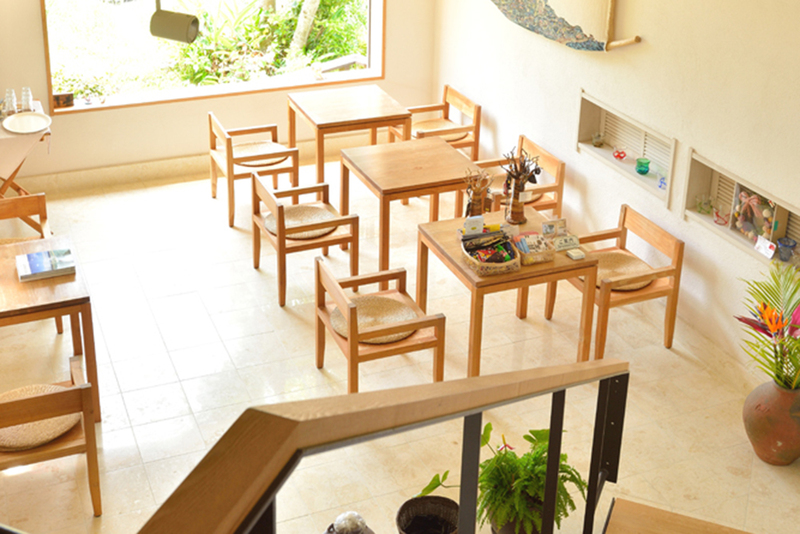 Young Okinawan artists’ works are displayed throughout the interior. There are no TVs in the rooms, please relax and enjoy this extraordinary atmosphere. 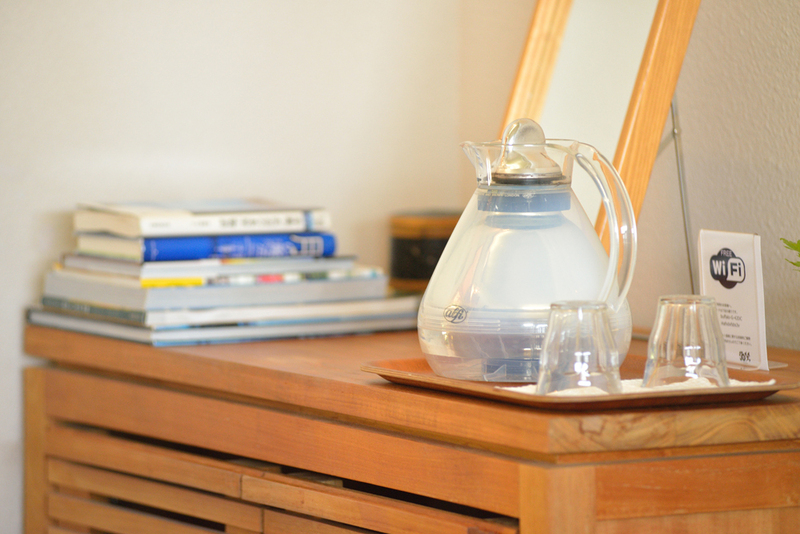 Rooms are equipped with the following items. * Please bring your personal sleepwear. * Toilets and baths are communal use. There are no toilets and baths in the rooms. * There is free Wi-Fi for use throughout the building. 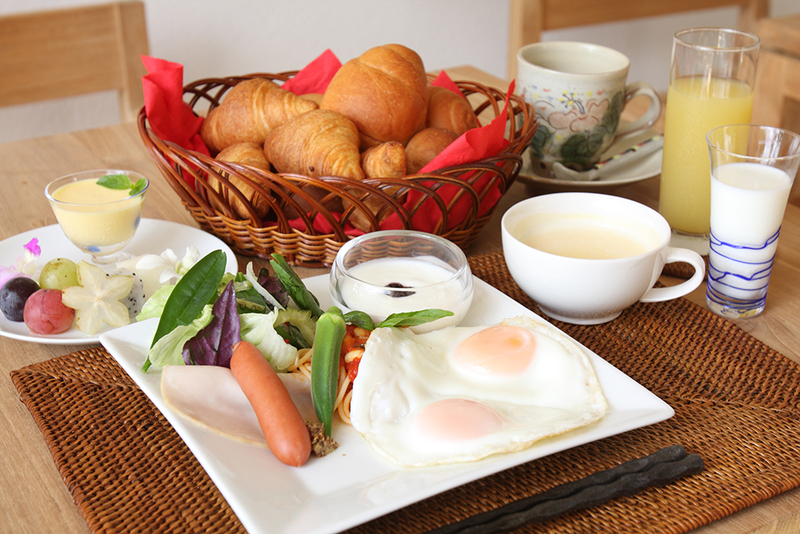 * There is a refrigerator and electric pot for sharing in the dining room. All four rooms are non-smoking twin rooms. 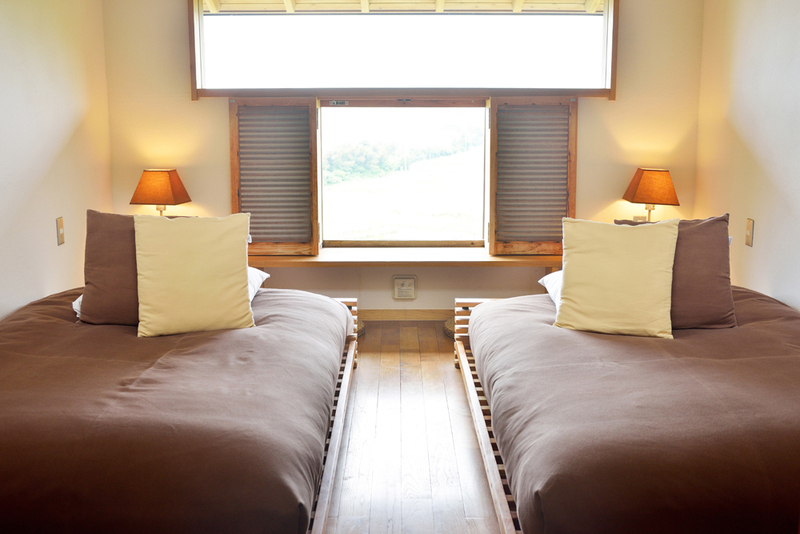 The low type spacious semi-double bed is made out of pure Teak wood specially manufactured in Indonesia. 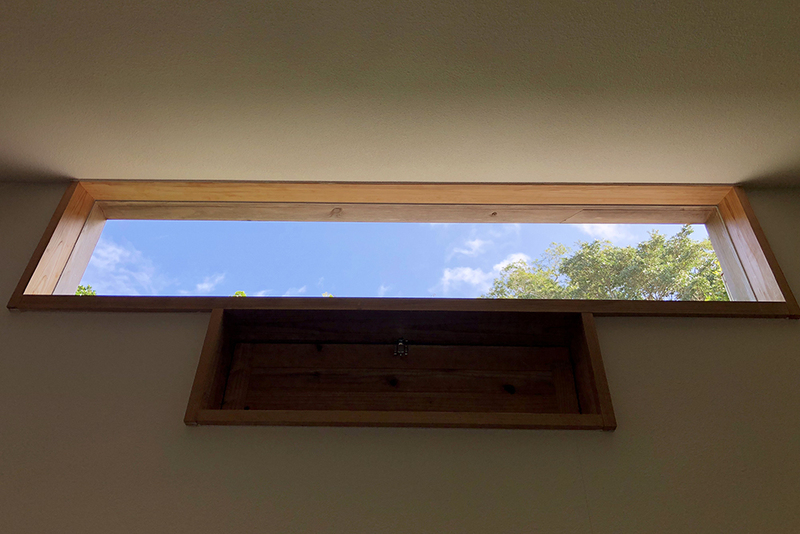 Also, the view of the ocean can be seen from all the rooms and on clear days you can see the starry sky from the ceiling window. 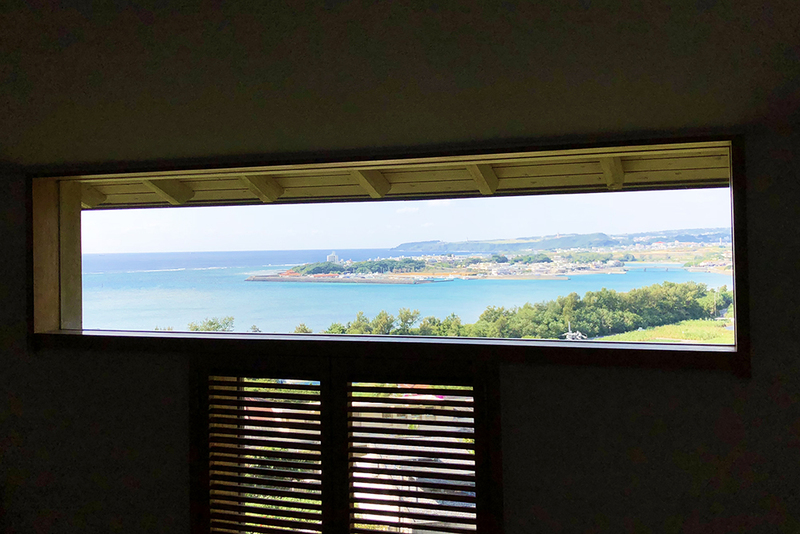 From the dining room window you can view the Chisabaru sea even more beautifully. We offer a welcome drink service so please relax and enjoy the spectacular view. 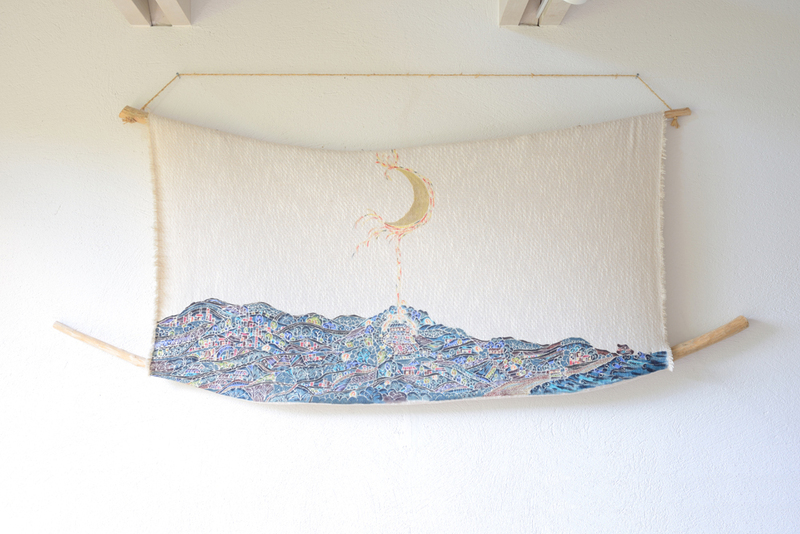 With just the perfect amount of light, the view from the big dining room window looks as if it's an artwork. In front of the rooms is an open corridor where you can unwind. 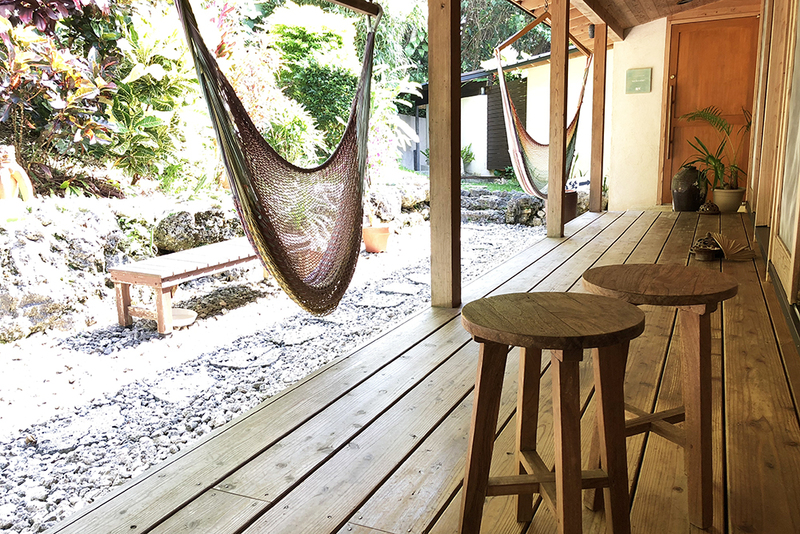 When the weather is nice you can take a nap or read books in the hammocks. 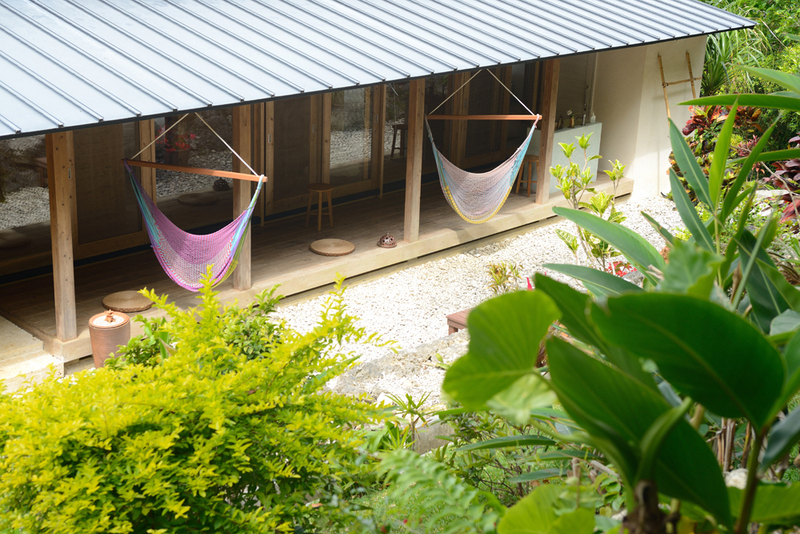 Beyond the courtyard grows Kaiza’s forest where you can hear the bustling sounds of birds and nature. 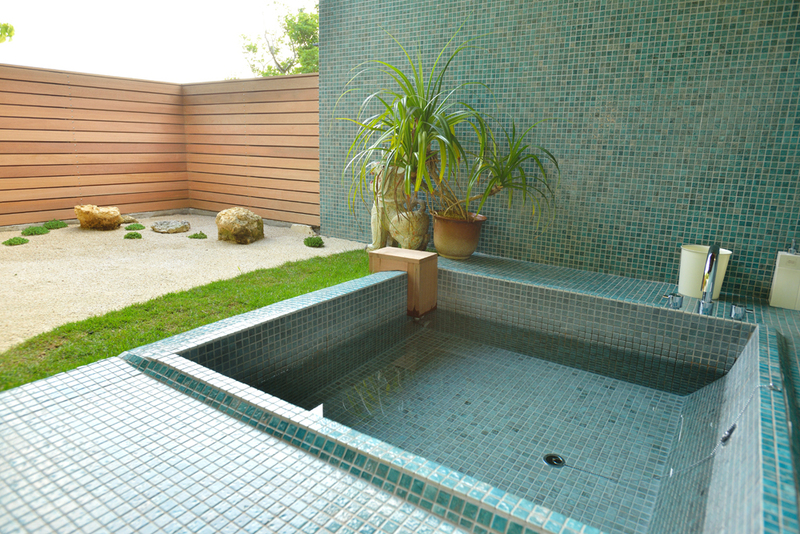 The open air bath has a “Bali” theme with the color blue as its basis. 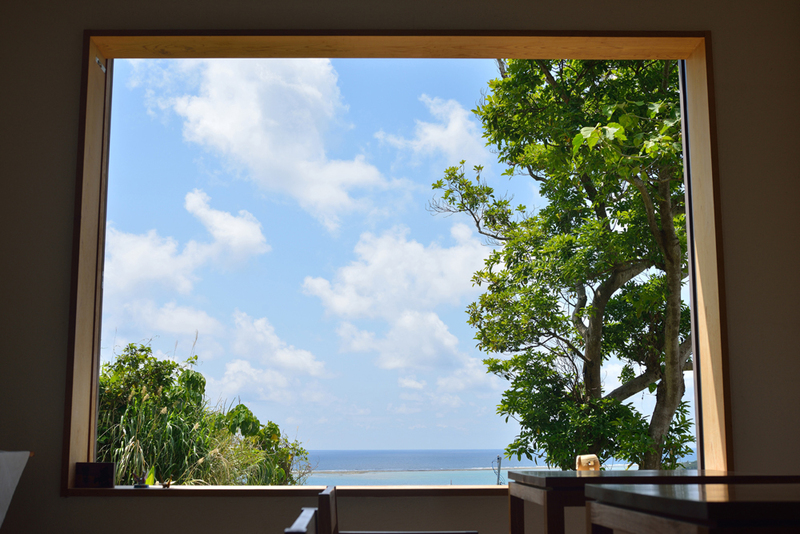 Relaxing in the open air bath while looking out to the Chisabaru sea is exceptional. The shower is equipped with two shower heads from the long established German faucet maker, Grohe. 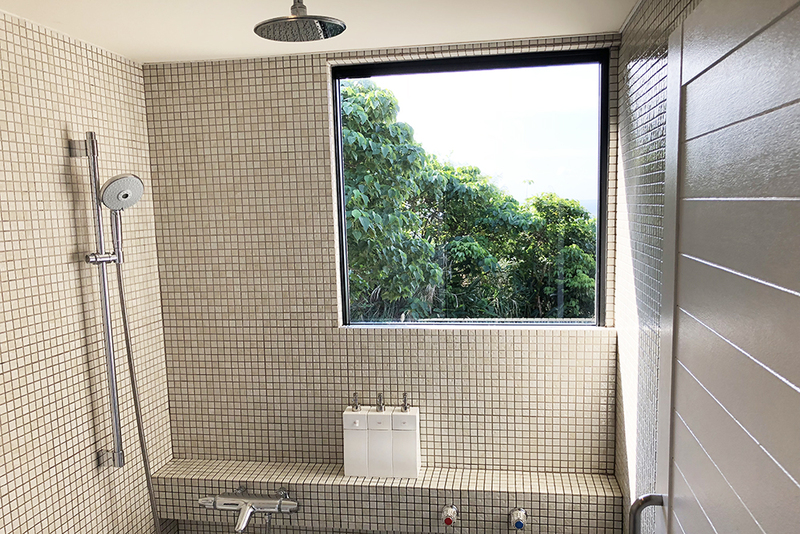 The sprinkling water from the big shower head has an immense refresh and relax effect. 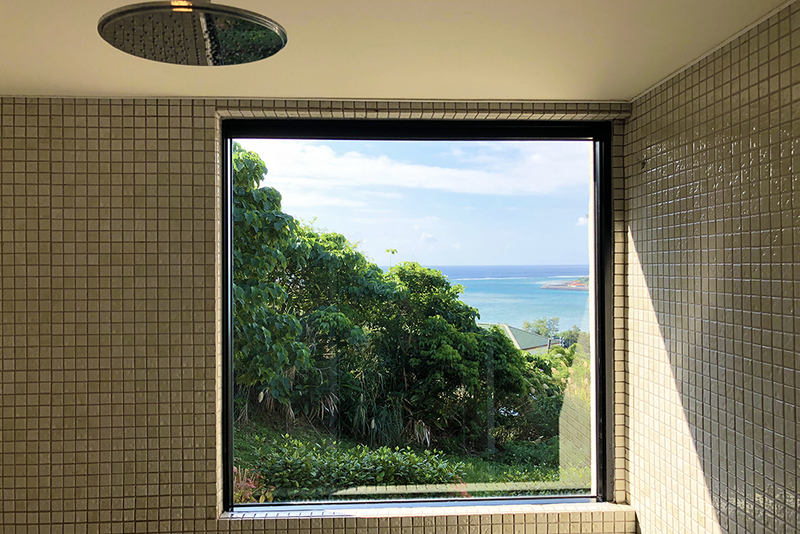 You can also enjoy the view of the sea while the rain-like water sprays down from the ceiling. Kaiza is built in the middle of nature and there is a forest behind the building. Sometimes there are small bugs in the open corridor and open air bath. 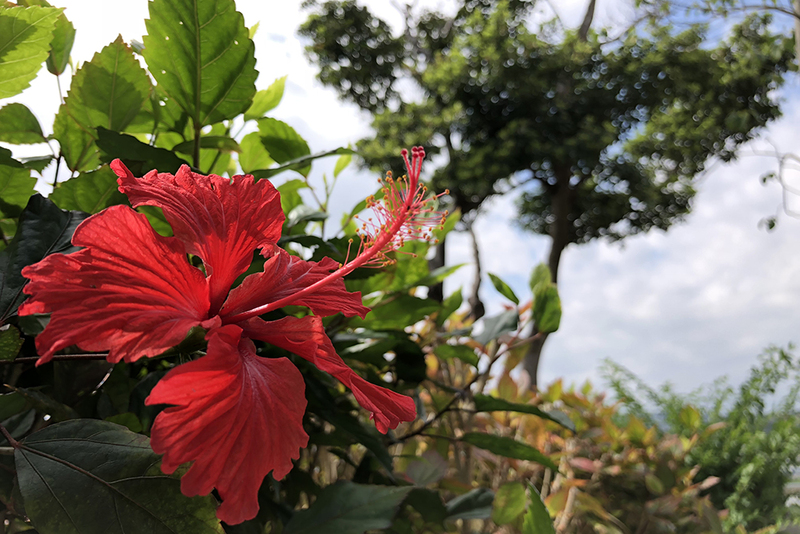 We kindly appreciate your understanding that our operation is coexistent with nature. Copyright©2019 Kaiza All Rights Reserved.